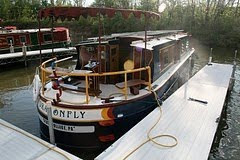 to leave their boats and shop at the lock. We interrupt the boat technology reports for some sightseeing. 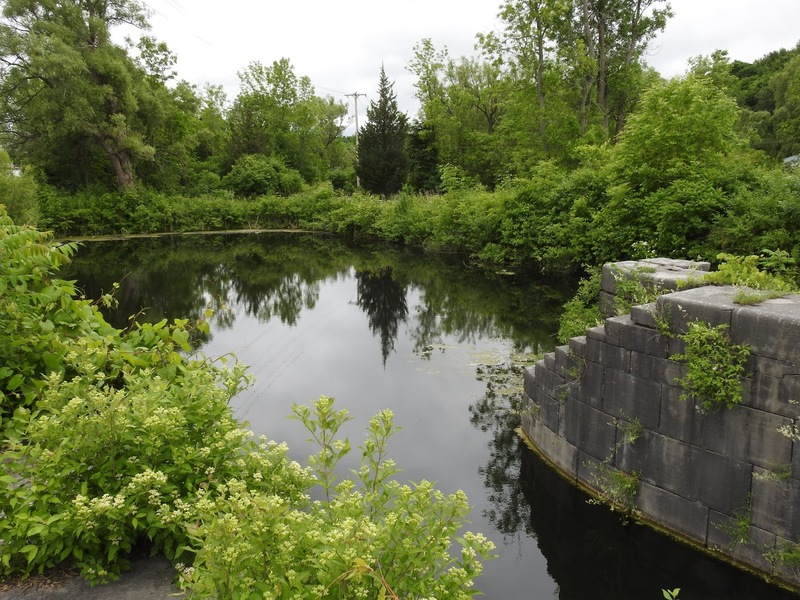 Not far from Lyons, NY (where we are still docked, working on the propulsion system) is an old Erie Canal lock. It was constructed when the canal was widened in the 1840s and abandoned in 1911, when the canal was rerouted and widened some more. I walked the two miles out of town to check it out. Officially, this is "Enlarged Erie Canal Lock 56." 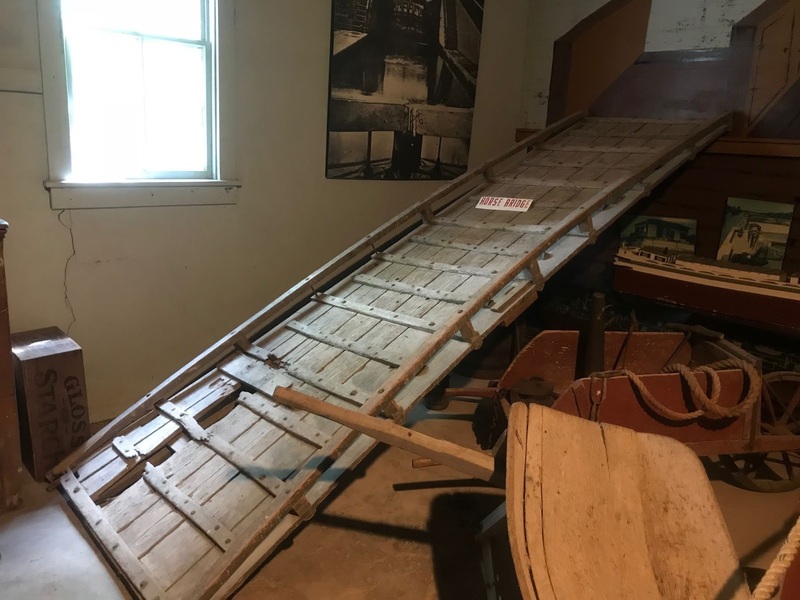 But back in the day it was called the Poorhouse Lock, because not far away was the county "poorhouse," a place of refuge for people who today might go homeless. The indentation in the wall at right is where the gate would have fitted. "locking down" while another was "locking up." For me, it was a bit melancholy to wander along the edge of the lock, taking in the weeds and decay. The neatly cut dark stone is still sharp-edged, the convenient staircase sturdy and strong. It would be fun to time-travel and see the place in its heyday, bustling with boats locking through. The brick building pictured at left was the general store. (Today it's a private residence.) 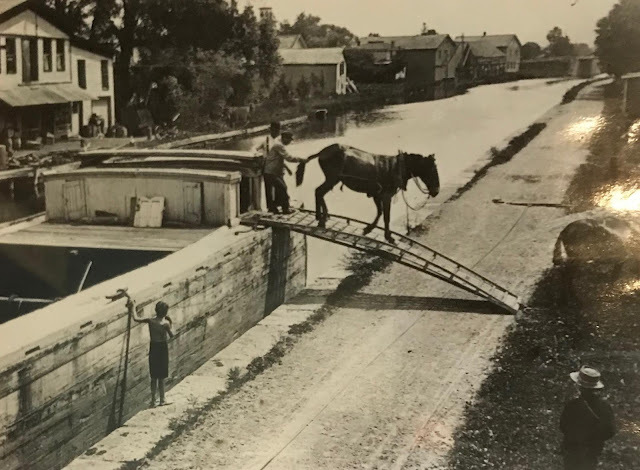 Back in the day, there was also a large shed, for the mules that pulled the canal boats. There was also a locktender's cottage, and probably some other outbuildings. Later in the day I visited the local historical museum. One highlight was seeing a "horse bridge," a structure that, previously, I'd only seen in pictures. 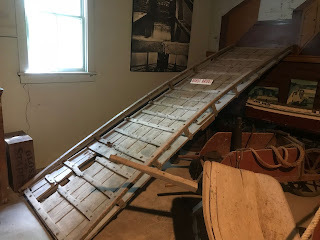 It's a curved wooden ramp that mules or horses could use to board or disembark from the canal boat. During a "shift change," the bridge was deployed while the boat was moving (so as not to waste time). It dragged along the towpath while the fresh mules walked down, and then the tired mules walked up to take a rest in their floating stable. Today, the Wayne County Poorhouse no longer stands. 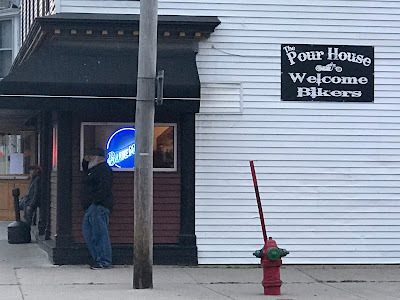 But in homage, the local biker bar in Lyons is called "The Pour House." the brakes on an incline. The Pour House in Lyons. $2 drafts on Tuesdays!